Public records and meetings provide notice of the official actions taken by government and the process by which government reached those decisions, giving citizens the opportunity to see what their government is doing in their name. In short, they promote government accountability. 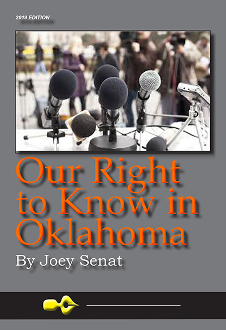 This book is designed as a primer on Oklahoma’s Open Records and Open Meeting acts. To explain what the reader needs to know, the book connects the dots between statutes, court decisions and attorney general opinions to analyze what these right-to-know laws mean.